The state flag of Florida consists of a red saltire on a white background with the state seal on the center. The design was approved by popular referendum on November 6, 1900. The flag represents the land of sunshine, flowers, palm trees, rivers and lakes while the seal depicts the bright sun, a palmetto tree, a sailing steamboat, and a Native American Seminole woman scattering flowers. The Florida State flag is a popular choice for businesses and residents. Show your love for Florida with our complete line of indoor/outdoor flags and indoor flag display kits. Available in two different fabrics of Nylon and polyesters and offered and several sizes including 3’x5’,4’x6’, 5’x8’ 6’x10’, and 8’ x12’, our flags are made with premium quality materials and feature bright and UV resistant colors and reinforced stitching. 100% made in the USA, our commercial grade flags include a 6 month guarantee on construction and color. Shop from our complete line of Florida Flags right away and get the best prices, quick shipping, and much more! 100% customer satisfaction guaranteed! 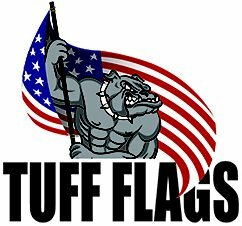 Tuff Flags has a complete line of Florida state flags including nylon and polyester flags and also complete indoor flag kits in solid Oakwood to cater to your diverse flag presentation needs. Show your state pride with our Florida flags which are made to precision and beauty. Made of high quality nylon and finished with heading and grommets, our outdoor nylon Florida flag is made with 200 Denier Nylon, a lightweight, quick dry, and sturdy material which flies effortlessly even in light breeze. 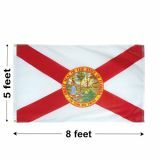 Our outdoor Polyester Florida flag is constructed with extra-tough, 2-ply polyester that is designed to withstand heavy wind and the most hostile weather conditions. Looking for an easy to set up flag display? Our Indoor flag kit is the perfect choice. Our heavy metal ornaments, flagpoles, and gold tassels will all make your flag display the perfect crowd pleaser. 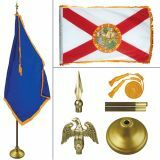 Our Florida state flags are great for schools, auditoriums, homes, business events, and more. Browse our collection for your Florida flag needs and we can help you pick up a perfect flag well within your budget. Need help? 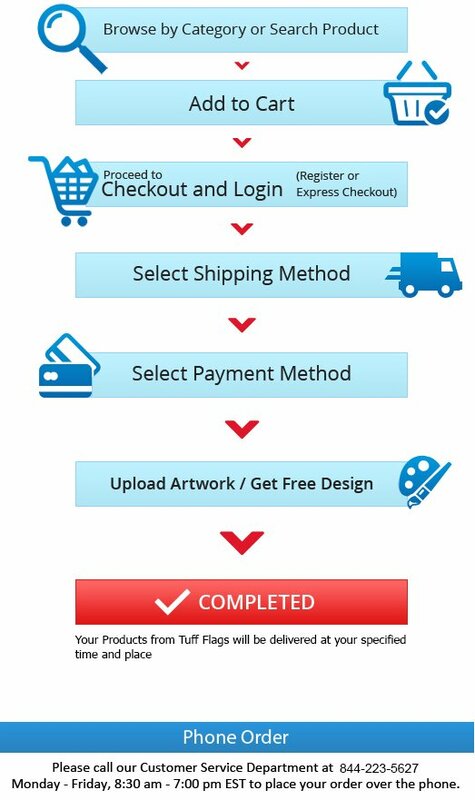 Call us at our toll free number (888) 287-3524 or email us at customercare@tuffflags.com and we will be glad to help you.